good/--. Used sticker to spine, hightlighted text, tight binding. 8vo, 162 pgs. In this volume of The New Church s Teaching Series, Harold T. Lewis surveys the teachings and witness of Anglicanism and the Episcopal Church concerning the Christian vision of a righteous social order, including the challenges of the new millennium. 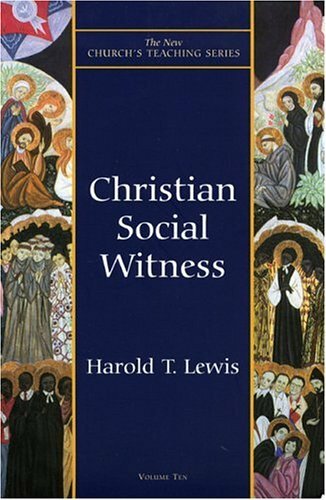 Beginning with the Bible s understandings of social justice, Lewis summarizes the Anglican witness of theologians like F. D. Maurice and William Temple and goes on to discuss the Episcopal Church in the nineteenth and early twentieth centuries. Later chapters discuss the challenges of a new social order that face the church today raised by liberation theology, third-world debt and economic justice, and questions of race, gender, and human sexuality. As with each book in The New Church s Teaching Series, recommended resources for further reading and questions for discussion are included.